If you’re anything like me, you get inordinately excited every time you see a tweet from @MonmouthPoll.1 Not only is Monmouth University’s polling operation one of only six pollsters with an A+ grade in FiveThirtyEight’s pollster ratings, but it’s also great about polling elections that otherwise don’t get much attention. First, it’s of a congressional race — it’s rare to get high-quality polls of any U.S. House races, especially this early in an election cycle. Second, it’s the sixth U.S. House poll2 that Monmouth has conducted this year. We’re always in favor of pollsters focusing on a handful of important but less high-profile races rather than being one of dozens to poll the same old swing states. The release of the poll was timely, given Tuesday’s revelation that Rohrabacher — who has been criticized for his pro-Russia sympathies — had met with Maria Butina, who was charged Monday with attempting to influence U.S. politics as an illegal Russian agent. (Because the poll was conducted July 11-15, the results don’t reflect any changes in public opinion in response to that news.) But we’re interested in what the poll can tell us about the battle for the House generally, in addition to what it means for Rohrabacher. The 48th District has a FiveThirtyEight partisan lean3 of R+4, meaning that it is 4 percentage points more Republican-leaning than the nation as a whole. Yet according to an average of Monmouth’s two likely-voter models, the Democrat is leading in this district by 3 points. That implies that the national political environment is leaning Democratic by 7 points (because D+3 is a 7-point shift toward the Democrats from R+4). We can do this exercise with all six House polls4 that Monmouth has released so far. West Virginia’s 3rd District is a special case, because West Virginia is an extremely Republican state on the presidential level whose voters remain open to voting for Democrats in down-ballot races. But even throwing that data point out, the Monmouth polls imply a 6-point shift toward Democrats from the partisan lean, on average. That’s right in line with the 6- to 9-point lead Democrats have held in generic-ballot polling over the weeks that Monmouth has conducted these polls. It’s well below the average 16 points by which Democrats have outperformed partisan lean in federal special elections since President Trump’s inauguration, but that’s not too surprising: Special elections, by definition, do not feature incumbents (who have a built-in advantage), which the general election races in California’s 48th District, Pennsylvania’s 1st5 and Virginia’s 10th all do. Indeed, the existence and relative strength of incumbents might explain why some of those districts are leaning leftward more dramatically than others. New Jersey’s 11th District is an open seat, and it features the biggest shift toward Democrats from its partisan lean (excluding West Virginia’s 3rd): 10 points. By contrast, the smallest shift — barely a shift at all — comes in Pennsylvania’s 1st District, home to not only a Republican incumbent practiced at winning a swing district (Brian Fitzpatrick), but also a Democratic nominee who has been dogged by bad press over his residency and stance on Israel. 32 percent of Americans approve of the way Trump handled his recent summit meeting with Russian president Vladimir Putin according to a CBS News poll taken Tuesday and Wednesday. That includes 68 percent of Republicans and only 8 percent of Democrats. According to Gallup, 22 percent of Americans say immigration is the most important problem facing the nation today, making it this month’s most commonly chosen top problem. That number is up 8 percentage points from last month, and it’s the highest Gallup has recorded since it began asking the question. According to a YouGov poll, 28 percent of Americans (including 58 percent of Republicans and 9 percent of Democrats) say they believe that Trump is being framed by the FBI and the Department of Justice. YouGov has asked this question every month since March, and those numbers have remained relatively unchanged. A Morning Consult survey asked Americans to guess how many calories were in 40 popular restaurant foods. On average, people’s estimates were 110 calories off the true number. Not bad! A Pew study looked at over 700,000 Facebook posts made by members of Congress from 2015 through 2017 and found that 😠 overtook ❤ in user reactions after the last election. Given Congress’s low approval ratings, it is a feat that ❤ was ever ahead in the first place. 46 percent of Americans say they are extremely interested in the November elections according to a Fox News poll. That’s compared to 29 percent around this time in 2014 and 28 percent in 2010. About half of Americans said they have intentionally avoided talking with friends and family who have different political views than themselves according to the Fox News poll. That includes 52 percent of Democrats and 46 percent of Republicans. 33 percent of Americans say they or someone they know personally has used a fertility treatment to try to have a baby, according to a recent Pew poll. Only about half of American adults believe that the nation’s elections are fair and open, according to an IPSOS poll. That includes 43 percent of Democrats and 68 percent of Republicans. In the wake of disagreements over Brexit strategy in the United Kingdom, the Labour party is retaking the lead in recent polls over the Tories. Labour support has remained fairly steady, but the polling average for Tories has fallen 4 percentage points in the past month as support for the nationalist UKIP party, which advocates for a cleaner break from the European Union, has doubled. Several polls show a noticeable drop in Russian President Vladimir Putin’s approval ratings among Russians. The polls were from the Levada Center, an independent pollster; Public Opinion Foundation, the polling agency the Kremlin uses; and Kremlin-friendly pollsters including WCIOM. Trump’s approval rating continues to hold steady. According to FiveThirtyEight’s tracker, 41.8 percent approve of the job Trump is doing as president, while 52.8 percent disapprove (a net approval rating of -11 points). That’s close to where it stood last week, when 42.3 percent approved and 52.7 percent disapproved (a net approval rating of -10.4 points). 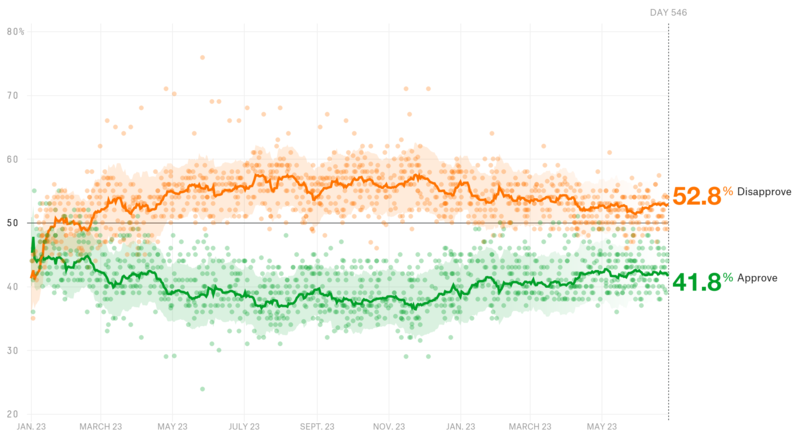 However, those numbers are a tad worse than his standing one month ago, when 42.3 percent approved and 51.5 percent disapproved, for a net approval rating of -9.2 points. 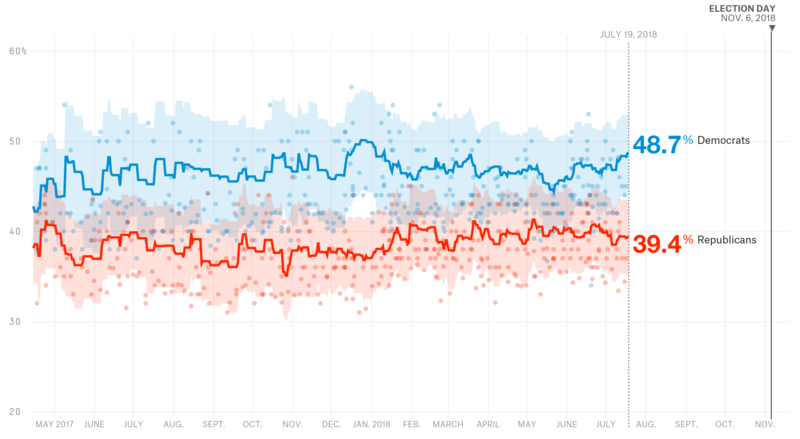 In polling of the generic congressional ballot, Democrats have widened their lead to 9.3 percentage points; they are currently ahead 48.7 percent to 39.4 percent. Last week, they led 47.9 percent to 39.5 percent (an 8.4-point margin). One month ago, they led 47.4 percent to 39.8 percent (a 7.6-point advantage). CORRECTION (July 20, 2018, 12:40 p.m.): A previous version of the second table misspelled the names of Mickey Mantle, Cal Ripken Jr. and Ted Williams. Technically, Monmouth also polled West Virginia’s 1st and 2nd congressional districts, but I’m excluding those surveys from this analysis because the sample sizes were so small. Also, note that one of the six is of the special election on Aug. 7 in Ohio’s 12th Congressional District. Of California’s 48th District, New Jersey’s 11th District, Virginia’s 10th District, West Virginia’s 3rd District, Pennsylvania’s 1st District and the special election in Ohio’s 12th District. Pennsylvania’s congressional districts were redrawn earlier this year. The current House member from the 8th Congressional District is now running in the 1st.